The old adage is that real Ferraris come with big 12-cylinder motrs and the poseurs' models have little engines. Well, what about a Ferrari with a little 12? 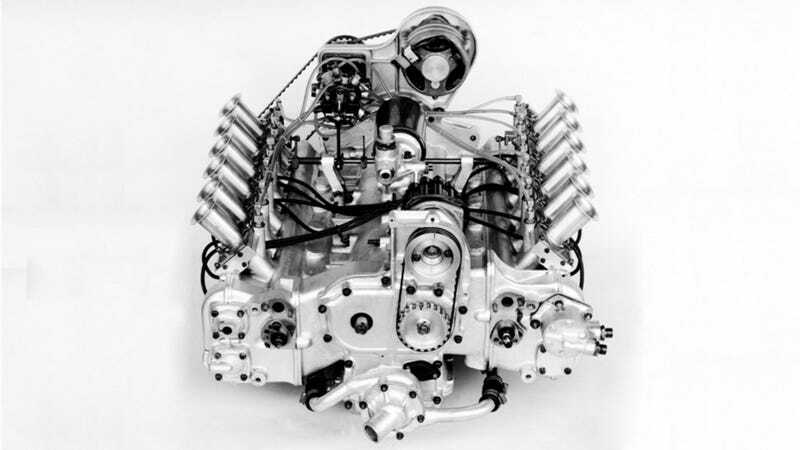 This is the engine to the Ferrari 212 E Montagna. By 'the engine' I do mean the engine. This was a one-off design using what was basically an expanded version of Ferrari's mid '60s 1.5 liter V12 used in Formula One. Four valves per cylinder meant the thing eventually produced some 300 horsepower, pushing a mere 500 kilos of dry weight. The layout was a 180 degree vee, also called a flat 12. The car ended up not in endurance racing, but in short-distance sprints. It ran in the 1969 European Hillclimb Championship (which was much more of a big deal back then) and absolutely dominated. The car won every race it entered and claimed the season title. All I want to know is what that 12 sounded like wailing through the gears.